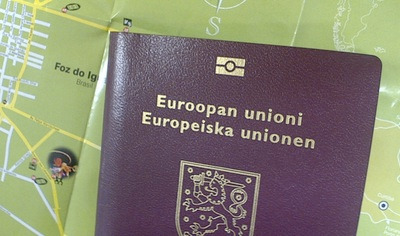 I have criticized the remote-readable EU passports before, but today I got to try their benefits: the automated border controls at Helsinki-Vantaa airport. I was returning back from Switzerland, and although they've recently joined the Schengen treaty, air passengers are still checked for passports until March. This means that the Finnair flight still ended up in the non-Schengen terminal of Helsinki-Vantaa, forcing me to go through the border checks. I'd seen the machines there before, and as I now wasn't in a hurry, I decided to try them. The experience is quite cool, but somehow it also feels a bit scary to validate your entry to your home country to a machine. 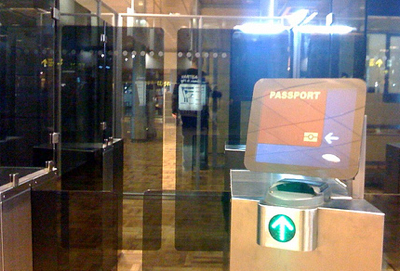 To enter the country you insert the passport into a reader, which then opens the first gate. Inside that gate is another machine in front of which you need to stand. It takes a picture, and apparently compares that to the one stored on the chip in the passport. If the pictures match, a second gate opens and you're in the country. I considered keeping my hat on to see what happens if the identification fails, but then decided not to bother. In any case, as with electronic check-in machines, people generally are too afraid of technology to use the automated border check, meaning that this is a great way to skip queues. Of course, none of this would require the passports to be remotely readable, not to mention the other security issues with them. 17 November 2006. 3 minute read.